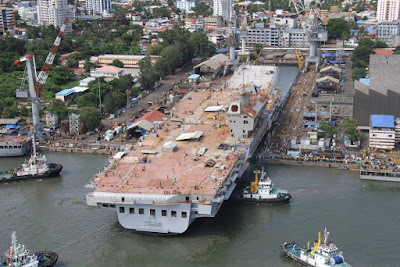 The largest and the first indigenously-built, 40,000 tonne aircraft carrier (IAC) to be christened as INS Vikrant on comissioning was undocked on 10 Jun 15 at a simple ceremony held at the Cochin Shipyard Limited (CSL). 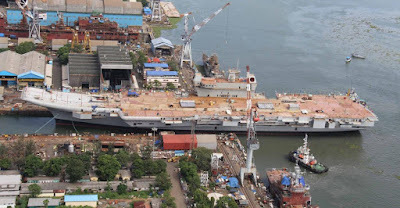 The ship, being built at CSL, would be required to undergo a series of fitment and trial processes and tests before it becomes ready for propulsion and inducted into the Indian Navy. 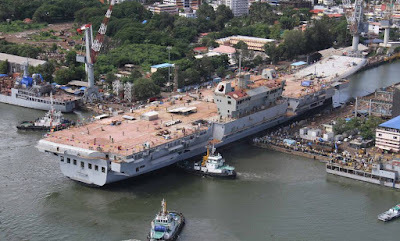 Major outfitting work of the ship would be undertaken in the coming months. 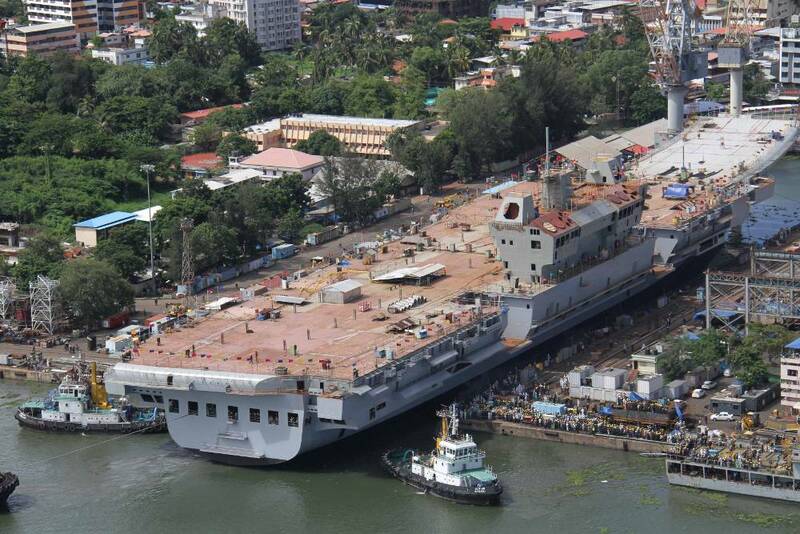 Prior to its delivery to the Indian Navy, the ship has to undergo basin trials and extensive sea trials. The basic design of the IAC was done by the Indian Navy's Directorate of Naval Design. 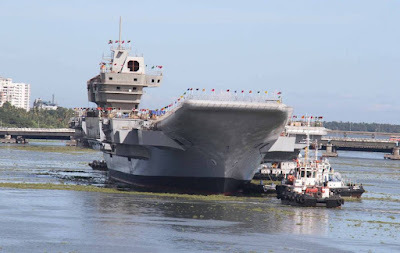 The successful completion of aircraft carrier puts India in the elite group of four nations in the world who are capable of designing and constructing aircraft carriers. The other four countries are US, Russia, UK and France. The ship has a length of over 260 metres and breadth of 60 metres. 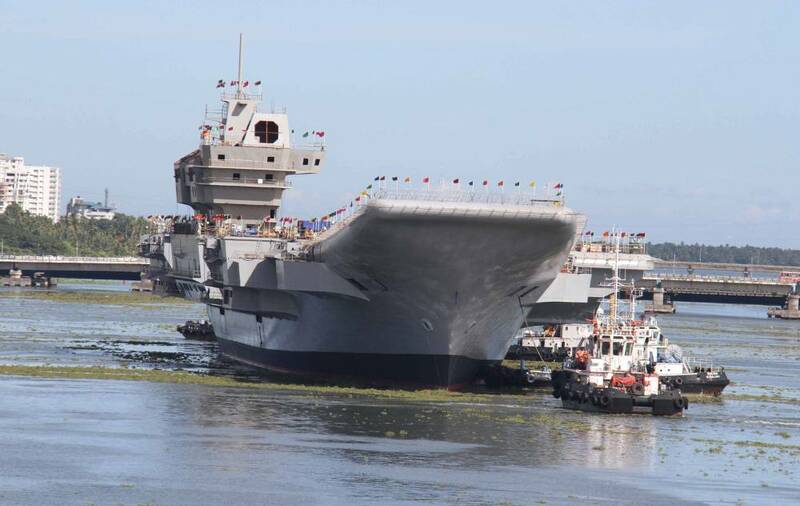 It has two take-off runways and a landing strip with three arrester wires, capable of operating STOBAR aircraft including the indigenous LCA, as well as a range of helicopters with hangar facilities. 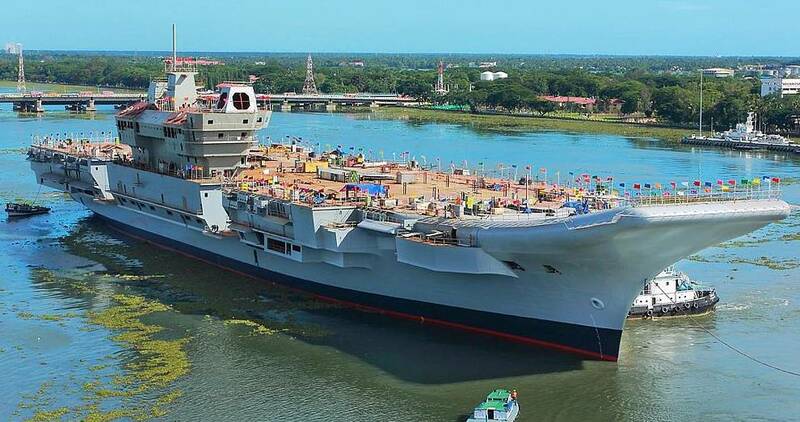 India, on Wednesday, crossed a major milestone in defence shipbuilding when the maiden indigenous aircraft carrier INS Vikrant was undocked on completion of structural work at the Cochin Shipyard. 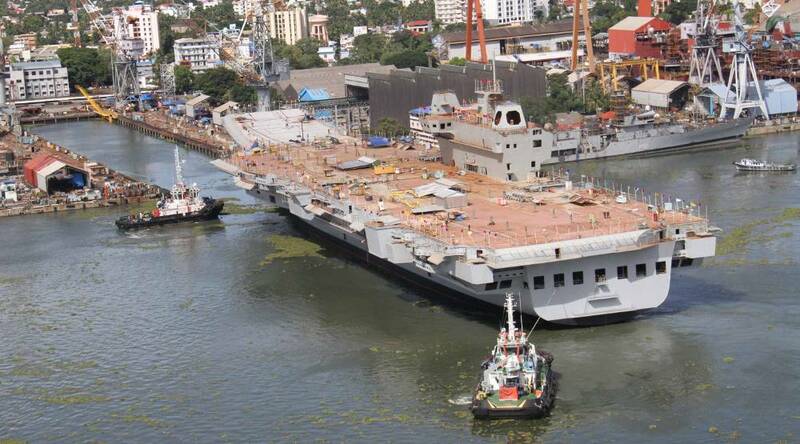 The carrier is slated for induction in end-2018. Senior officials and workers of the public sector yard witnessed the undocking, done around 2 pm. 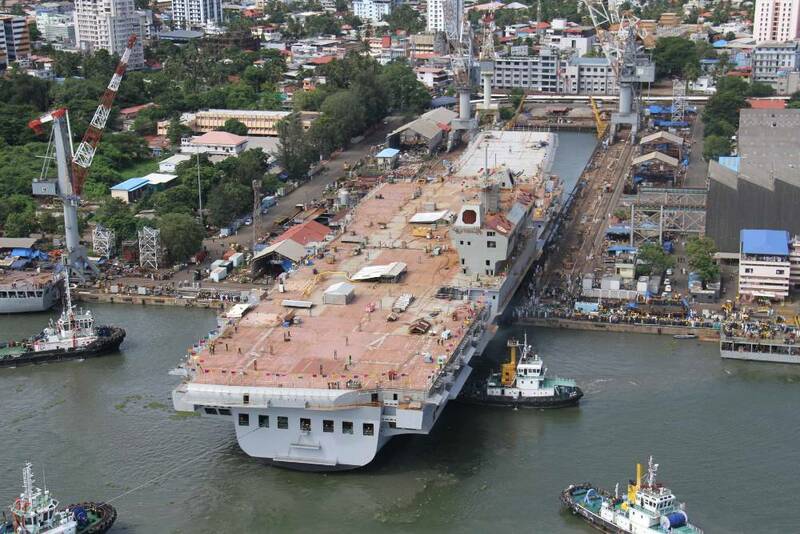 Problems with the dock gate and siltation at the gate mouth had forced the yard to postpone the undocking a few times earlier. This time around, flooding of the dock and ballasting of the ship had begun on Monday itself. 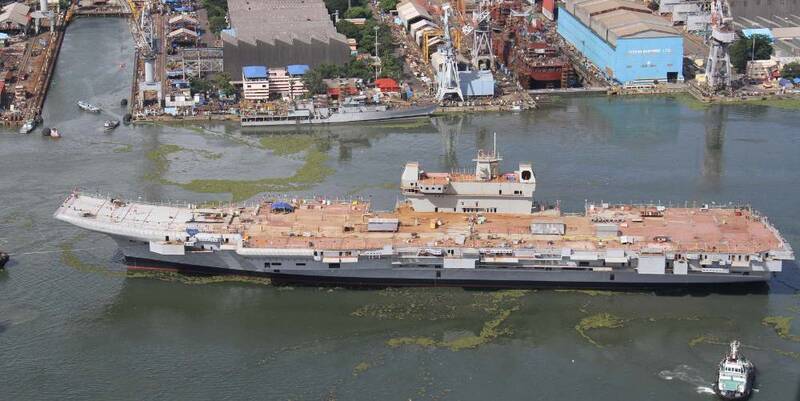 Once the vessel was floated over 8 metres of water pumped into the dock, the floodgate was overturned, after which Vikrant was pulled out by tugs. 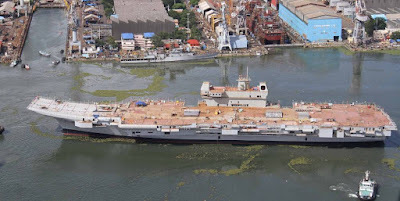 Vikrant, weighing about 22,000 tonnes now, will continue to be outfitted for over a year and a half now before the basin and sea trials begin ahead of delivery. 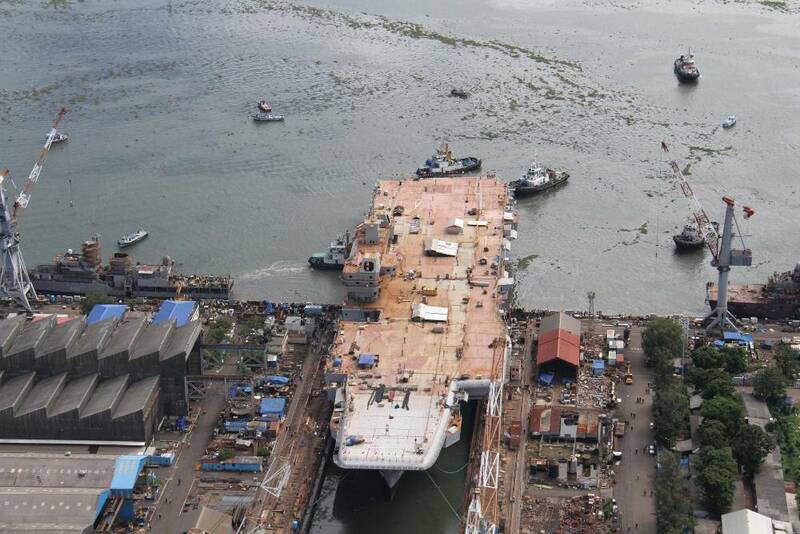 "Almost 90 per cent of works below the fourth deck, all underwater works, is over. Major equipment have gone in. Cabling, piping, electrical works, heat and ventilation works will take place now. Delivery of systems and components for the aviation complex designed by the Russian Nevoske design bureau is expected anytime now," said an official. The undocking is part of the second phase of work on the carrier, which is expected to be complete by 2017, when the basin trials will get under way.